Jim’s days in prison are the same, over and over. He does morning lineup, goes to the chow line, does laundry, laps in the yard, goes to sleep. His only joy is a photo of Lee he keeps over his bed. Things change one morning, when the warden calls Jim out of morning lineup. After several weeks with no incidents, Jim is being transferred to F-Wing. He has been in protective custody up to this point, but the warden points out it couldn’t last forever. F-Wing is full of people that Jim put away. Guards drag him to F-Wing, where the prisoners circle him like sharks. The warden clearly has it out for Jim: “The only way out of F-Wing is parole or a body bag. And nobody gets parole.” Ex-commissioner Loeb says ominously. Jim sees drug trades going down almost out in the open, and he asks the guard if the warden gets a good cut of the business. The warden doesn’t take kindly to this, and tells an inmate named Weaver that he wants the “boy scout” dead by week’s end. Bullock is apoplectic when he finds out Jim has been sent to gen pop. He visits Jim at the prison, and promises he is looking for Penguin. Jim asks about Lee, and Bullock tells him the bad news: Lee lost the baby. She moved down south to be with her family, and no one has heard from her since. He begs Jim not to give up, but Jim is despondent and wanders away. Back inside, Weaver stops Jim. His brother was part of the Red Hood Gang and Jim killed him. Jim doesn’t respond to this, but when Weaver finds Lee’s photo and offers to have his “friends” pay her a visit, Jim goes nuts. He head butts Weaver and a kid named Puck steps in to try to keep the peace. The prisoners start beating both of them up and the guards step in. Weaver is sent to the hole while Jim and Puck go to the infirmary. Puck compliments Jim, claiming he is a true hero because when his sister was abducted, he found her. Puck is inside for stealing a car that he was going to take back after a date. Cops caught him and he got six years. Puck’s grandfather died in prison; he vows that won’t happen to him, and has been keeping his nose clean. Jim suggests that he stay away from him. The warden comes in and sends the guys back to their cells, but warns Jim that he knows he just lost a child. One of the guards seems sympathetic to Jim. He warns him that Weaver is coming back from the hole. Weaver warns Jim that he is a dead man, and starts kicking Puck’s *ss. The guard prevents Jim from intervening and warns him to let it go; otherwise his sentence will be extended. Meanwhile, Bullock is having a secret meeting with someone, asking for help. “We all know Jim didn’t kill that kid,” he insists, and has no one else to turn to. 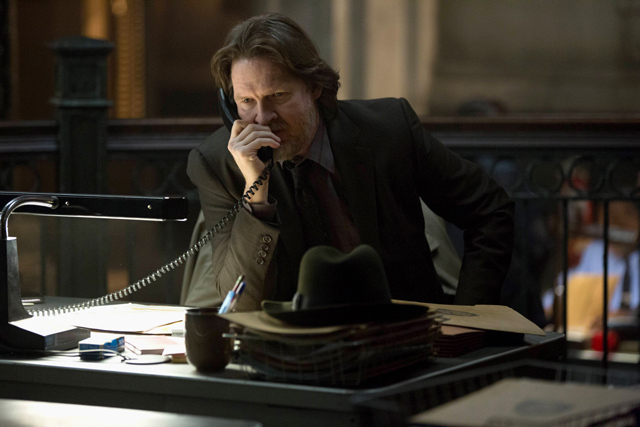 We finally see who he has gone to for help: Falcone. The kindly guard warns Jim that tonight is movie night: everyone in the main hall with the lights off. “Be ready.” Jim tries to avoid it, but movie night is not optional. He takes his seat nervously for Seven Brides for Seven Brothers. One of the inmates makes a show out of dancing in front of the screen, riling up the crowd. Weaver takes a seat behind Jim. While the guard is taking away the unruly prisoner, another inmate beats Weaver to Jim and shivs him over and over. “You’re dead,” he whispers – but not threateningly. “Stay down. Understand?” Jim does, and the kind guard checks his pulse. They will need a body bag. Jim is wheeled out of the prison in a body bag, as the warden predicted. At the ambulance he sits up and is unzipped from his bag. Bullock is one of the ambulance drivers, and he admits to Jim that Falcone set this all up with fake blood and a retractable knife. “What if this is where I belong?” Jim asks hesitantly. Bullock points out a lot of people risked their lives for Jim, and that seems to snap Jim out of it. He agrees to go, but needs one more favor. Jim goes back into the prison, to the infirmary, and gets Puck. Before they can leave, the warden shows up with a gun. The guard shows up and knocks out the warden, then insists Jim hit him so it looks like he fought his way out. 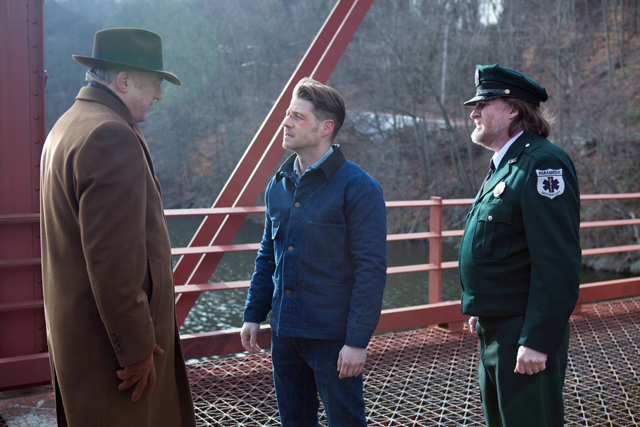 Bullock, Jim and Puck make it out and meet Falcone on a bridge outside of Gotham. Falcone is happy to help an old friend, but now Jim has a choice to make. 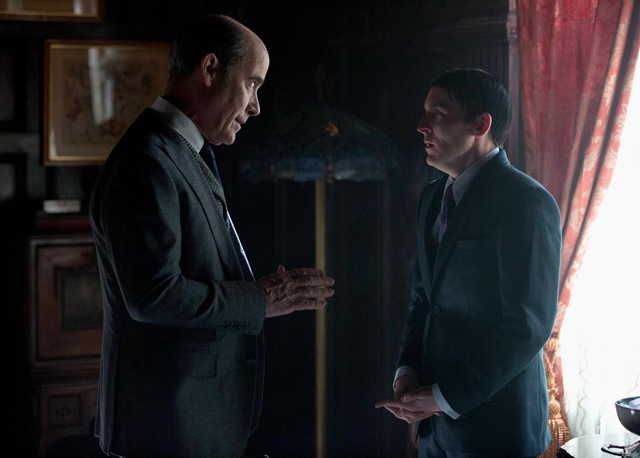 Falcone can arrange a safe place for Jim inside of Gotham, or he can get him out of the country, but then he will have to be on the run forever. Jim wants to find Lee. In order to do that, he has to clear his name, and to do that, he has to go back to Gotham. It is risky, but Jim is a fighter. He goes to Puck to see what he thinks, and finds Puck is dead. Cheesy music soars as Jim casts his gaze towards Gotham. In another part of town, the Van Dahl family is having dinner. After his mother died, Elijah couldn’t leave the house for months. When he finally did, he would just go to a diner and order soup. Grace, his waitress, befriended him. She was running from an abusive relationship and had two kids, Sasha and Charles to look after. Elijah invited them to move in with him. Love blossomed and they married. But Penguin is Elijah’s only blood relative. Sasha breaks a glass – clearly she is worried about her inheritance. The next day, Grace and her kids interrupt Penguin and Elijah playing a card game to warn him that Penguin is a criminal. “We could have all been raped and murdered!” Grace insists in false panic. “To be fair, I never raped anyone,” Penguin clarifies. Elijah knows all this and tells his wife to relax. They storm out of the room and Grace goes to Plan B. Sasha is Plan B.
Penguin wakes the next morning to find Sasha leaning over him seductively. She opens her robe and insists that there is a little bad boy left in him. “Whatever your plan is for Elijah, I want in.” Penguin freaks out and runs to the other side of the room. “You are practically my sister!” She stomps away and reports back to Grace and Charles. Charles offers to try, but Sasha doesn’t think he is faking it; she thinks he is just simple. While Elijah is fitting Penguin for a new suit (the family business), he collapses into a chair. The doctor is called and he reveals that Elijah’s condition has worsened. The hole in his heart is bigger and now it is infected. It is time for Elijah to get his affairs in order. Elijah doesn’t want Penguin to worry, but wants to speak to his lawyers, just in case. Grace is alarmed, worrying that Penguin will get what she deserves. Penguin and Elijah are chatting after dinner about Elijah’s background. He admits that his father was never physically ill; he just suffered a “deep melancholy.” He killed himself, and Elijah heard it, saw his father after. It was years before he and his mother left the house. He thinks Penguin knows of that torment, and begs him not to give in to the pain. Elijah decides doctor’s rules be damned, and he has a drink while telling Penguin that he is leaving everything he owns to Penguin. The only stipulation is that Penguin keep the house just as it is. He will have the lawyers draw it up first thing in the morning. Elijah suddenly convulses and foams at the mouth. Grace and the kids come running in. 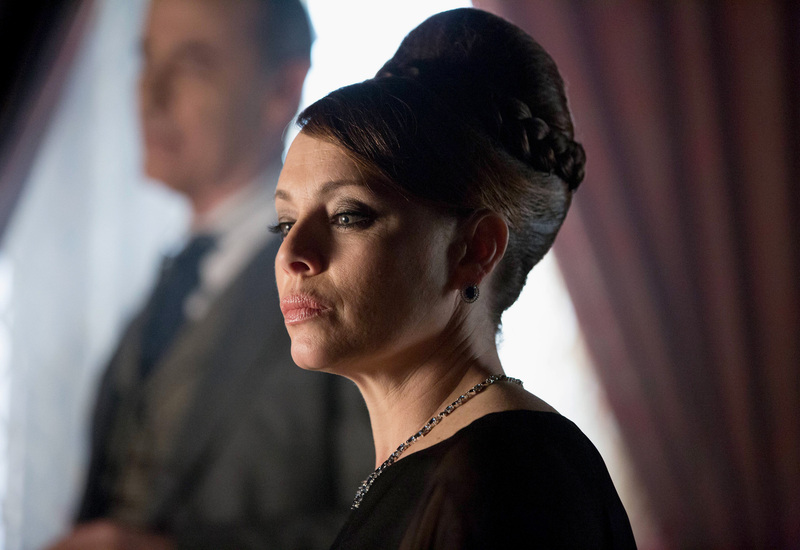 She is horrified that Elijah drank the liquor – Grace spiked it. Penguin was the one who was supposed to die. You can watch a preview for the next episode, titled “Into the Woods” and airing on April 11, using the player below.